This country is facing a set of challenges greater than any we've seen in generations. Our economy is in turmoil and our families are struggling with rising costs and falling incomes; with lost jobs and lost homes and lost faith in the American Dream. When it comes to our economy, our security, and the very future of our planet, the choices we make over the next few years will shape the next decade, if not the century. And central to all of these major challenges is the question of what we will do about our addiction to foreign oil. Without a doubt, this addiction is one of the most dangerous and urgent threats this nation has ever faced-from the gas prices that are wiping out paychecks and straining businesses to the jobs that are disappearing; from the instability and terror bred in the Middle East to the rising oceans and record drought and spreading famine that could engulf our planet. It's also a threat that goes to the very heart of who we are as a nation, and who we will be. Will we allow ourselves to be held hostage to the whims of tyrants and dictators who control the world's oil wells? Or will we control our own energy and our own destiny? Will America watch as the clean energy jobs and industries of the future flourish in countries like Spain, Japan, or Germany? Or will we create them here, in the greatest country on Earth, with the most talented, productive workers in the world? As Americans, we know the answers to these questions. We know that we cannot sustain a future powered by a fuel that is rapidly disappearing. Not when we purchase $700 million worth of oil every single day from some of the world's most unstable and hostile nations-Middle Eastern regimes that will control nearly all of the world's oil by 2030. We simply cannot pretend that we can drill our way out of this problem. We need a much bolder and much bigger set of solutions. We have to make a serious, nationwide commitment to developing new sources of energy and we have to do it right away. Breaking our oil addiction is one of the greatest challenges our generation will ever face. It will take nothing less than a complete transformation of our economy. It is a transformation that will require more than just a few government programs. Energy independence will require an all-hands-on-deck effort from America-effort from our scientists and entrepreneurs; from businesses and from every American citizen. Factories will have to re-tool and re-design. This will not be easy. And it will not happen overnight. But I know we can do this. We can do this because we are Americans. We do the improbable. We beat great odds. We rally together to meet whatever challenge stands in our way. That's what we've always done-and it's what we must do now. Creating a new energy economy isn't just a challenge to meet, it's an opportunity to seize-an opportunity that will create new businesses, new industries, and millions of new jobs. Jobs that pay well. Jobs that can't be outsourced. As President, I will immediately direct the full resources of the federal government and the full energy of the private sector to a single, overarching goal-in ten years, we will eliminate the need for oil from the entire Middle East and Venezuela. To do this, we will invest $150 billion over the next ten years, and leverage billions more in private capital, to build a new energy economy that harnesses American energy and creates five million new American jobs. There are three major steps I will take to achieve this goal-steps that will yield real results by the end of my first term in office. First, we will help states build the fuel-efficient cars we need, and we will get one million 150 mile-per-gallon plug-in hybrids on our roads within six years. The second step I'll take is to require that 10 percent of our energy comes from renewable sources by the end of my first term-more than double what we have now. To meet these goals, we will invest more in the clean technology research and development that's occurring in labs and research facilities all across the country. I'll also extend the Production Tax Credit for five years to encourage the production of renewable energy like wind power, solar power, and geothermal energy. It was because of this credit that wind power grew 45 percent last year, the largest growth in history. Of course, too often, the problem is that all of this new energy technology never makes it out of the lab and onto the market because there's too much risk and too much cost involved in starting commercial-scale clean energy businesses. So we will remove some of this cost and this risk by directing billions in loans and capital to entrepreneurs who are willing to create clean energy businesses and clean energy jobs right here in America. As we develop new sources of energy and electricity, we will also need to modernize our national utility grid so that it's accommodating to new sources of power, more efficient, and more reliable. That's an investment that will also create hundreds of thousands of jobs, and one that I will make as President. Finally, the third step I will take is to call on businesses, government, and the American people to meet the goal of reducing our demand for electricity 15 percent by the end of the next decade. In just ten years, these steps will produce enough renewable energy to replace all the oil we import from the Middle East. I want you all to think for a minute about the next four years, and even the next ten years. We can continue down the path we've been traveling. We can keep making small, piecemeal investments in renewable energy and keep sending billions of our hard-earned dollars to oil company executives and Middle Eastern dictators. Or we can choose another future. We can decide that we will face the realities of the 21st century by building a 21st century economy. In just a few years, we can see shuttered factories open their doors to manufacturers that sell wind turbines and solar panels that will power our homes and our businesses. We can watch as millions of new jobs with good pay and good benefits are created for American workers, and we can take pride as the technologies, and discoveries, and industries of the future flourish in the United States of America. This is the challenge we must meet. This is the opportunity we must seize-and this may be our last chance to seize it. And if it seems too difficult or improbable, I ask you to think about the struggles and the challenges that past generations have overcome. Think about how World War II forced us to transform a peacetime economy still climbing out of the Depression into an Arsenal of Democracy that could wage war across three continents. And when President Roosevelt's advisors informed him that his goals for wartime production were impossible to meet, he waved them off and said, "Believe me, the production people can do it if they really try." And they did. Think about when the scientists and engineers told John F. Kennedy that they had no idea how to put a man on the moon, he told them they would find a way. I ask you to draw hope from the improbable progress this nation has made and look to the future with confidence that we too can meet the great test of our time. I ask you to join me in the years to come, to ensure that we will not only control our own energy, but once again control our own destiny, and forge a new and better future for the country that we love. 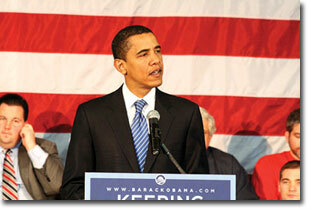 For the Record is an excerpt of a speech by then-candidate, now President-Elect, Barack Obama on New Energy for America in Lansing, Michigan in August 2008.